FARM FOOD FORK IS RAISING THE STEAKS for 2015! With the success of last year event, the West Kootenay Permaculture Co-op is pleased to announce that F3 will return on 27th March for a day-long event focused purely on the issue of local meat (the full conference will return in 2016). This was an issue raised as being of key importance in the Kootenay region during the 2014 conference, and this focused event will allow greater exploration of the issues and challenges that the subject of local meat production and consumption presents. The goal is to create a diverse, strong food future for the Kootenays that includes a resilient livestock community and an educated and engaged consumer base. The STEAKholder forum invites anyone involved in food or the local economy to attend, digging deeper into the issues we face in our local region and identifying solutions and actions that will enable our local meat production and economy to grow in a sustainable way. The evening event invites STEAKeaters to indulge in snout to tail bites, enjoy a live butchery session and cooking demos. 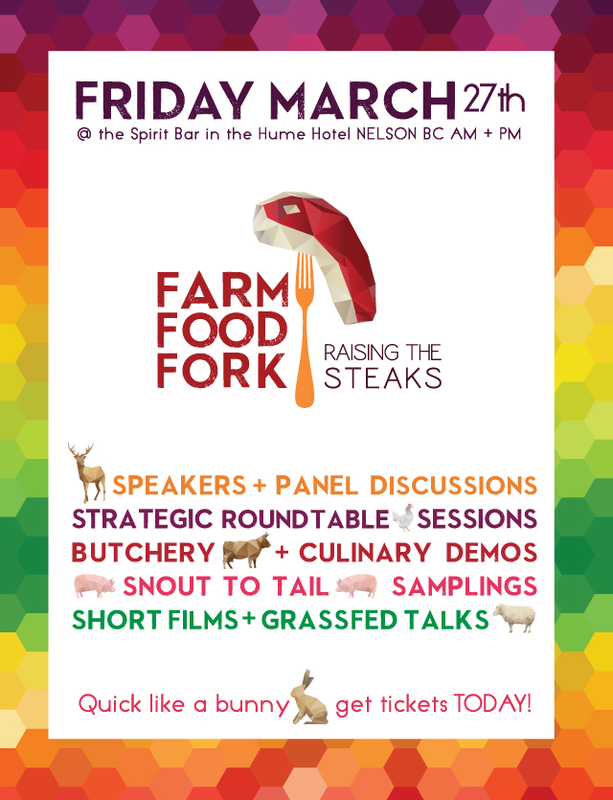 Attendees will learn about the challenges of sustainable local meat production through keynote presentations, short ‘grassFED Talks’ and films. Check out the event page for more info, check out our speaker line up, and buy tickets through the link on the tickets page! Our keynote speaker Felix Schellenbeg and his wife Jasmine will also be offering workshops on rotational grazing and biodynamic principles. You can find out more about these on the workshop page.